The Savannah Area Business Political Action Committee, which is closely associated with the Savannah Chamber of Commerce, has endorsed Mayor Edna Jackson and four incumbent aldermen for re-election. The group has also endorsed Brian Foster for the open Alderman At-Large post now held by Tom Bordeaux and three challengers trying to unseat incumbents in other aldermanic races. So, first, what is the SAB PAC, and why do I say the organization has close ties to the Chamber? The Savannah Chamber of Commerce, which is located at 101 East Bay St., is headed by president and CEO William Hubbard. Steve Green is a member of the Chamber’s Board of Directors and the Chamber’s 2015 CEO Council. Robyn Iannone is the Chamber’s Chief Financial Officer. And now cue all the objections, including seemingly endless variations on “How could any business person endorse Edna Jackson?” Well there are all sorts of possible correct answers to that question, and it’s disappointing to me that Jackson’s detractors can’t understand those rather obvious possibilities. I’d say it’s also fatal to the campaigns of challengers if they don’t understand why a group like SAB PAC would endorse Jackson and other candidates. Many business leaders assume that Jackson will win (and she probably will), and they want to back a winner. Many business people have been very successful over the last few years — several sectors of the regional economy are booming. They have an existing relationship with Jackson and have access. They have successfully secured city contracts since Jackson was mayor. They are invested in some way in specific policies that Jackson is likely to back. They think, on the whole, that Jackson is better than the challengers. I’m not saying I agree with any of those reasons, and I’m extremely concerned about some decidedly anti-business trends we’ve seen from the current city administration, like the interminable processes for adopting the New Zoning Ordinance, a new alcohol ordinance, and a food truck ordinance. Those are just examples, by the way; I could go on and on. There are also perhaps some more slippery issues at play, including the demands of racial politics (i.e., the SAB PAC couldn’t possibly endorse a fully white or black slate of candidates, for example) and the likelihood that many of the key players in this post have known each other for decades. 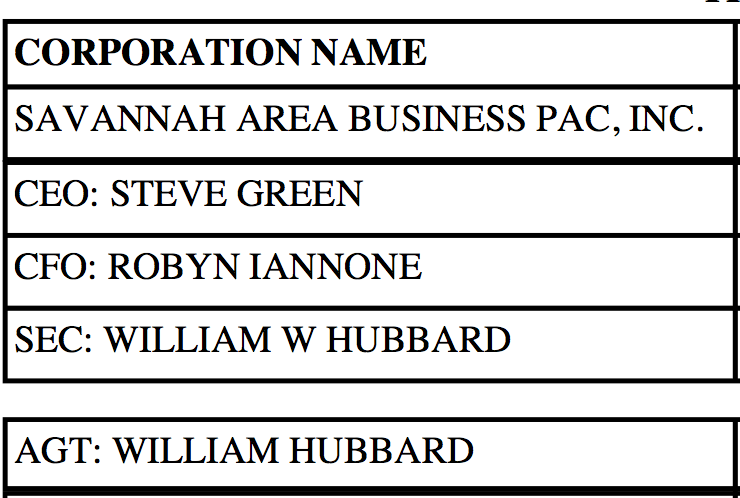 The SAB PAC endorsements beyond the mayor’s race are interesting. If you think that the political action committee is simply rubber-stamping the status quo, think again. It’s definitely meaningful that they are calling for the defeat of three sitting council members — Mary Osborne, Mary Ellen Sprague, and Estella Shabazz. *Carol Bell seems to me like one of the sharpest members of council, but she is going to have stop being so patient if she wants to see anything actually get accomplished. It seems likely that she and Van Johnson have their eyes on the mayor’s seat in 2019; if they are serious about stepping up, they’ll want a more substantial series of accomplishments than they have now. *The endorsement of retired bank president Brian Foster is no surprise, and Foster certainly knows something about business. But given the insidery feel of all this, the anti-establishment mood, and the increasing worries about tourism interests being too powerful, I wonder if Foster, whom I consider a good candidate, is even well-served by this endorsement. *I’m in the newly redrawn 2nd district, and I’m thrilled that there are credible challengers to incumbent Mary Osborne. Bill Durrence, Detric Leggett, and Andree Patterson all seem like solid candidates to me. *Interesting choice to endorse John Hall over challenger Kim Dulek, who gave an impressive interview to Connect Savannah recently. *I’ve never quite understood some of the antipathy toward sitting 4th district council member Mary Ellen Sprague, but Julian Miller is certainly a strong candidate. *Shaundra McKeithen seems prepared to be a fresh voice for the 5th district, but I have no sense for whether she has a chance of knocking off the incumbent Shabazz. *Love him or hate him, Tony Thomas has worked hard for many of his Southside constituents and has been an outspoken critic of the police department. More recently, he has expressed justifiable exasperation with city staff. I have no idea if his challengers in this election have any chance of taking the seat.